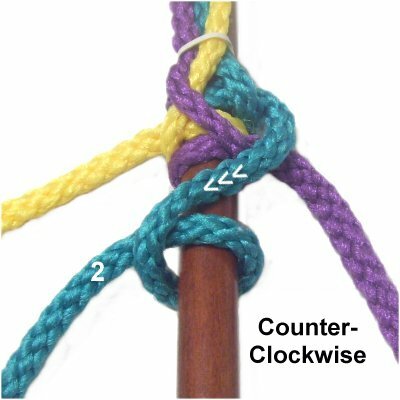 Description: The Cockscomb knot, also know as Ringbolt Hitching, is an interesting decorative knot seldom seen anymore. 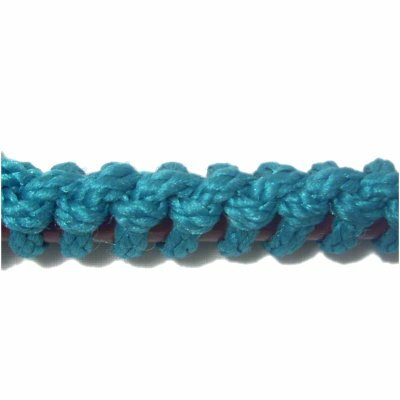 The front of the knot is a braided design that stands out from the front surface of the item holding the knot. The remainder wraps around the item, completely covering it. Since it has to be tied onto something, you could use this technique to decorate bottles, to cover a dowel or tube, or to wrap a thick bundle of cords together. The primary knots used are Half Hitches, but they are arranged in a unique way. The crossed elements are important, so pay close attention to the instructions and images shown below. 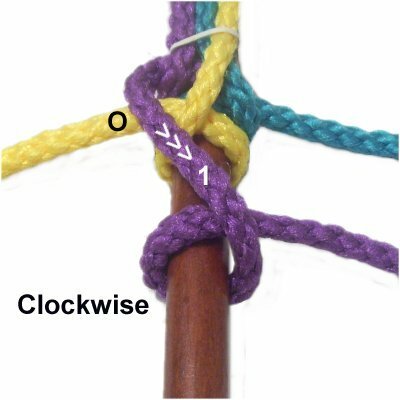 To practice the Cockscomb Knot, you need three cords at least 36 inches long. You will also need a 12-inch dowel or paper tube to hold the cords. Secure the cords at the top of the dowel, so they rest side-by-side. You can use rubber bands or tape to hold them in place. Arrange them vertically on your board or work surface. Mentally number the three cords (left to right). Label each cord by applying tape with the number written on it. Using three colors is another option. Place a small rubber band or tape at the spot where you want to start the design. Usually that will be close to one end of the item being wrapped. 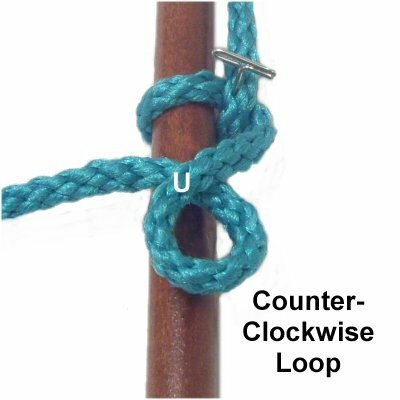 Step 1: Use cord 1 to tie a counter-clockwise Half Hitch, passing under-over the dowel or tube and under the cord. The cord should be heading left when you are through. Tighten the knot firmly, sliding it up to the small rubber band marking the starting point. 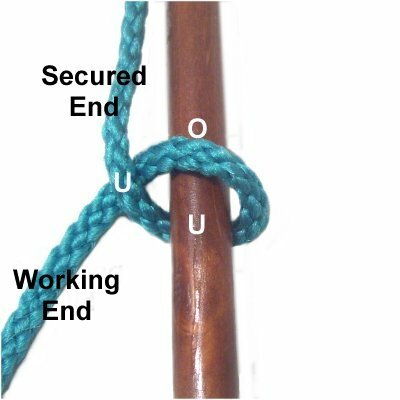 Designer's Tip: ALL the Half Hitches in the Cockscomb Knot are tied as described above (under - over - under). 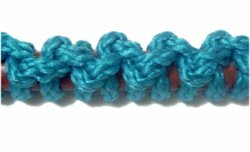 This is sometimes called a Reverse Half Hitch, especially in vintage patterns. Step 2: Move cord 2 down below the previous knot. 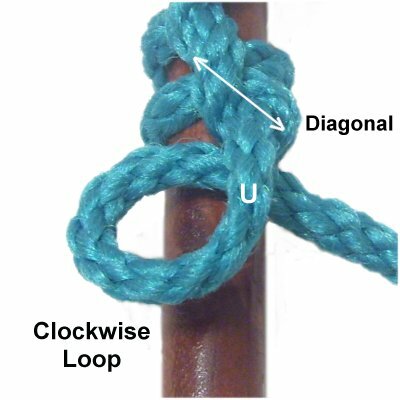 Make a reverse Half Hitch in a clockwise direction, so the cord is heading right when you are finished. 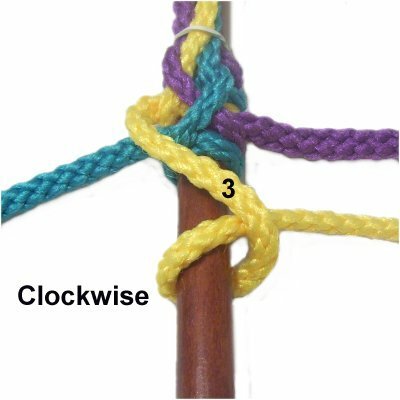 Step 3: Make the next Half Hitch with cord 3, in a counter-clockwise direction. Allow it to cross over cord 2 in the area above the knot. Slide it up next to the others, and tighten it firmly. Step 4: Pull cord 1 towards the right, passing over cord 3. It should cross over the top of the dowel diagonally (white arrows). 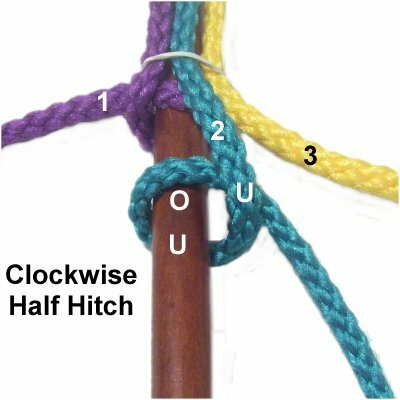 Tie the Half Hitch in a clockwise direction. Tighten firmly and push all the knots close together. Step 5: Pull cord 2 to the left, passing over cord 1. It should cross over the top of the dowel diagonally. 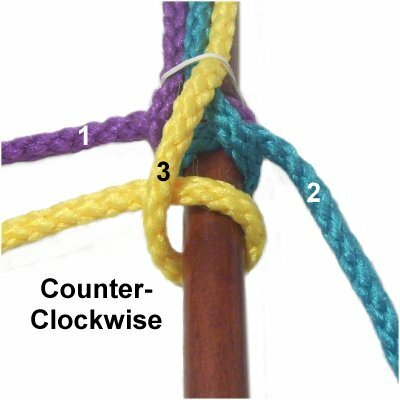 Tie the Half Hitch in a counter-clockwise direction. 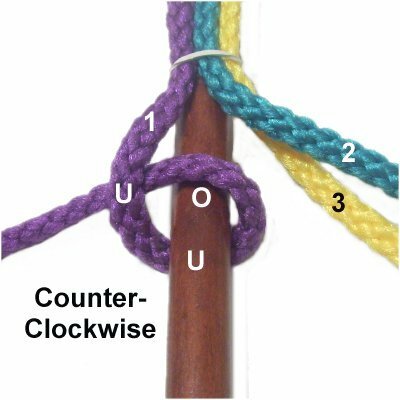 Have you figured out the concept for the Cockscomb Knot? You use the cords in order (1 - 2- 3), and alternate the direction the Half Hitches are tied. The most important part to this design is to always cross over the dowel prior to tying the knot. Step 6: Move cord 3 over cord 2, as you pull it to the right. 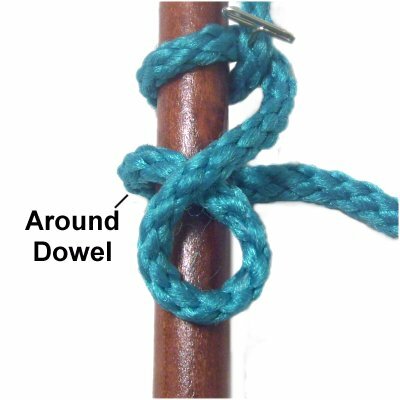 Tie a clockwise Half Hitch after crossing the cord diagonally over the top of the dowel. Step 7: Repeat steps 1 - 6 at least one more time, to complete the Cockscomb Knot. Make sure the cords wrap around the dowel evenly, so the coils are close together and do not overlap. Now that you've practiced the Cockscomb Knot, it's time to try a couple variations. 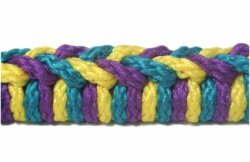 This design is called the Loop Ringbolt Hitch because it's made with loops rather than braiding. 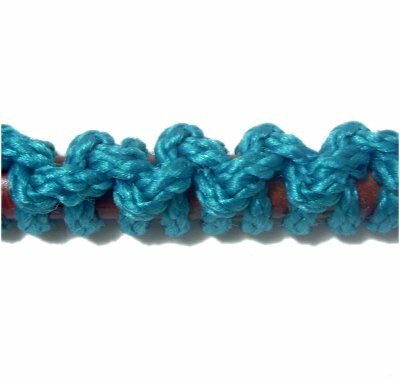 This technique is easier to make than the regular Cockscomb knot. 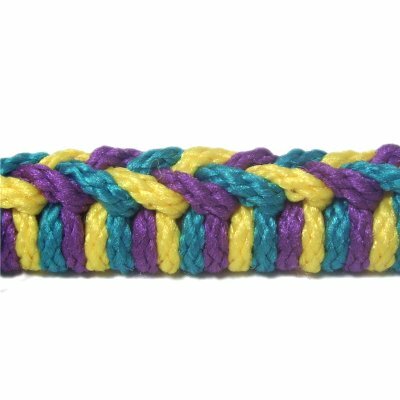 The loops aren't raised up as much as the braided form, so the design is more subtle. You may not be able to completely cover the item holding the knots, since the loops in the front create extra space between the coils in the back and sides. To practice, you need one cord, at least 45-inches long. Secure one end to the top of a dowel with a rubber band or tape. Pass the working end under - over the dowel, and under the secured portion of the cord. 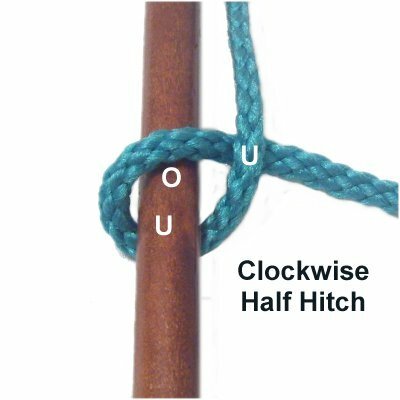 Step 2: Just below the Half Hitch, make a clockwise loop. Pass the working end under to form the crossing point. 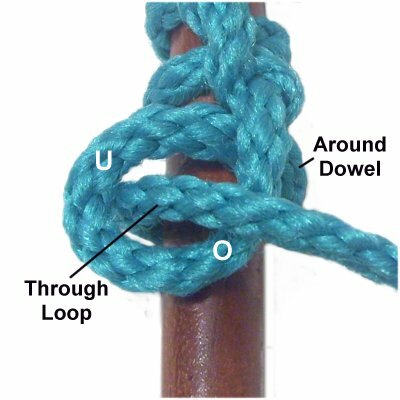 This loop should rest on the top surface of the dowel or tube. Step 3: Move the working end around the dowel from right to left, while holding the loop. 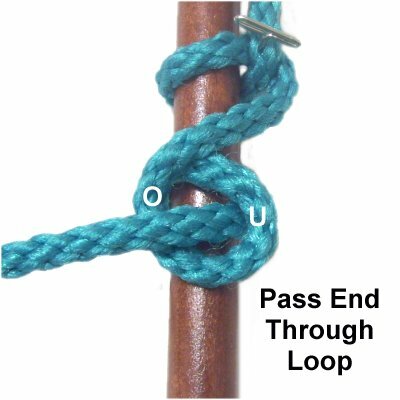 Step 4: Pass the working end through the loop from below (under - over). Tighten slowly, removing the slack from the loop first, followed by the remainder. 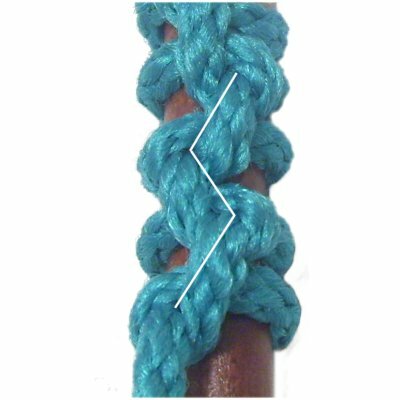 The completed knot should be firm, but not excessively tight. Step 5: Repeat steps 2 - 4 several times, completing this variation of the Cockscomb knot. Tighten all the knots the same so the spacing is neat. 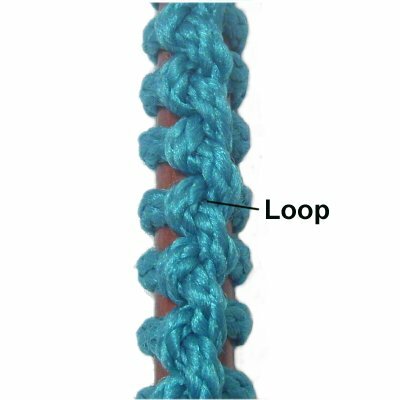 This variation of the Cockscomb knot is similar to the Loop Ringbolt, but the loops alternate direction and are tilted to form a zigzag pattern. 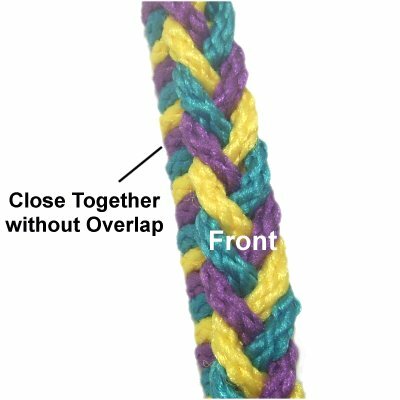 Like the previous design, the loops may not allow you to completely cover the item holding the knots. To practice this technique, you need one cord, at least 60 inches long. Secure one end of it to the top of a dowel with tape or a rubber band. 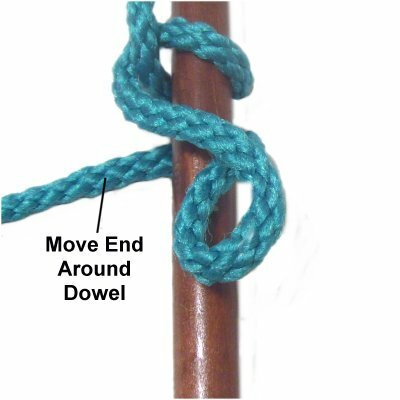 Step 1: Tie a clockwise reverse Half Hitch with the working end by making a loop under - over the dowel. 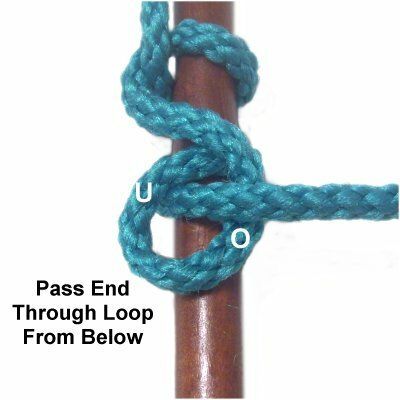 Pass under the secured end to complete the loop. Step 2: Make a counter-clockwise loop resting on top of the dowel. Make sure you pass the working end under to make the crossing point. Step 3: Pass the working end around the dowel from left to right, while holding onto the loop. Tighten the loop first, then pull the end to tighten the portion that goes around the dowel. Step 5: Arrange the first loop on a slight diagonal slant to the right (white line and arrows). 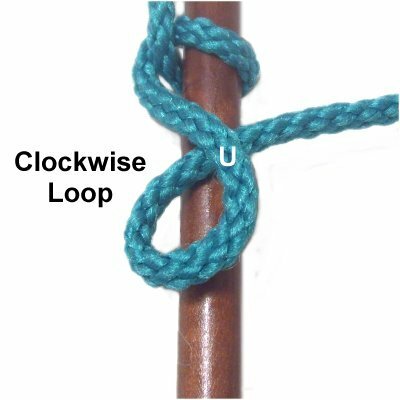 Make a clockwise loop with the working end, passing under to form the crossing point. Step 6: Pass the working end around the dowel, heading right to left, and through the loop from below (under - over). Tighten the loop first, then the remainder. Arrange the loop so it's diagonal and slightly to the left. Step 7: Repeat steps 2 - 6 at least twice, so you can see the zigzag pattern for this variation of the Cockscomb knot. The white line in this image follows the center of four loops, and shows how they are supposed to be arranged. Have any comments about the Cockscomb Knot? Contact Me.